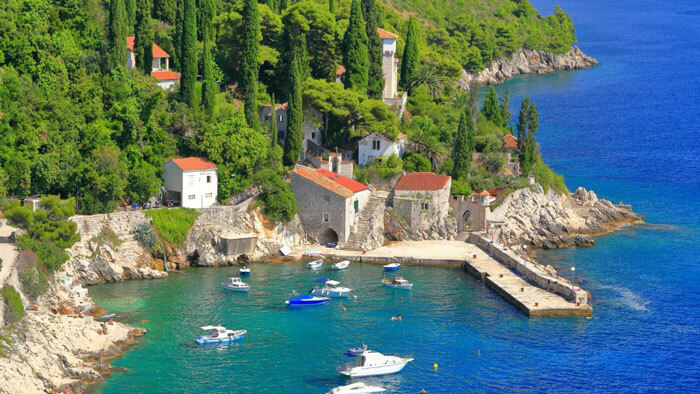 Croatia is an ocean paradise with 1,200 islands and 4,000 kilometers combined coastline, located east of Italy across the Adriatic Sea, plus more! Snorkeling, diving, sailing and of course swimming – at a different natural beach every day of the week – the turquoise clear water is beckoning with consistent beauty wherever you are along the coast. Beaches, islands and ocean are clean and the scenery interspersed with quaint historic villages. 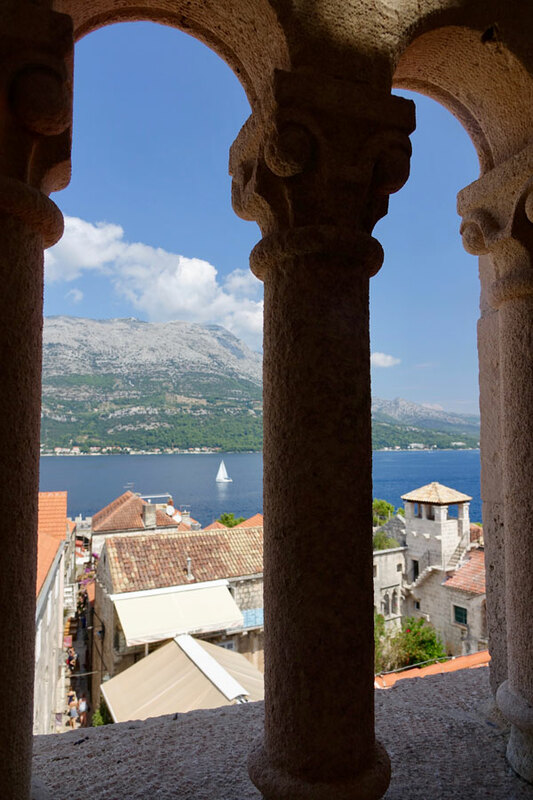 Because of its crossroad position between East and West, Central Europe and the southern tip of the Mediterranean, Croatia developed a rich culture over centuries. 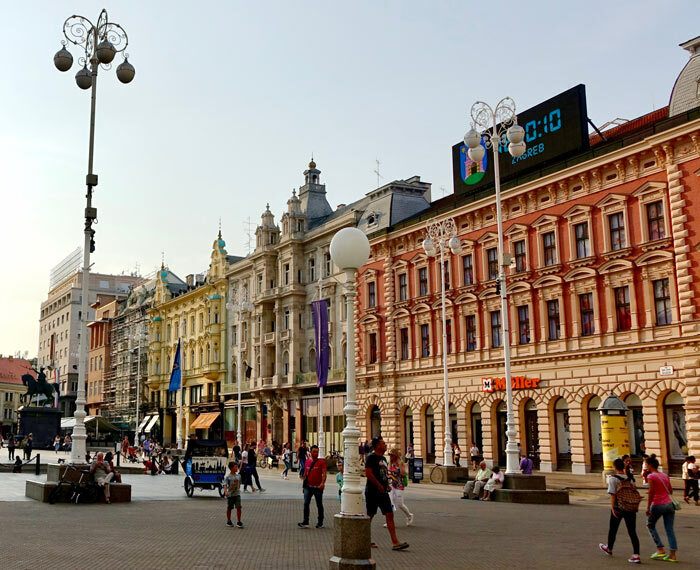 Remnants of earlier civilizations – Ottoman, Greek, Roman, Bronze Age, right up to Viennese high culture are visible throughout Croatia in architecture, art, music, dance and gastronomy. 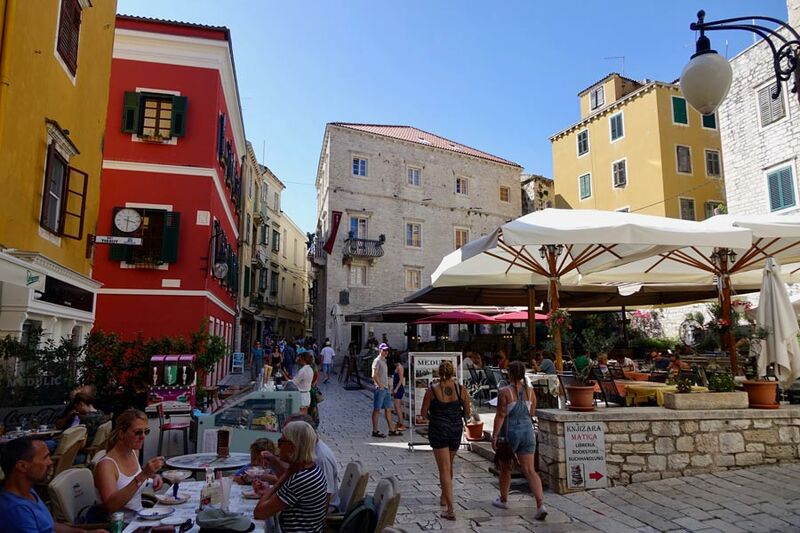 Somewhat off the beaten track, the charming old town of Šibenik with its colorful houses & interesting boutiques is grouped around the 15th century Romanesque Cathedral of St. James. Renaissance architecture, decorated with 71 sculpted faces (some of them women! ), the magnificent Dome is fashioned after the Florence Cathedral. Inside, the unusual crypt is beautifully lit by natural light, mysteriously illuminating elegantly chiselled stone angels which smile benevolently upon visitors, putting a hush in the air. The city of Dubrovnik with its massive, 16th century stone wall (astonishingly never affected by any war), is a stunning, albeit touristy must-see destination. Be sure to take the cable car up to Mount Srd in the early evening and have your hotel make dinner reservations at the restaurant on the top. The crimson sunset blaze over the azure-blue ocean, followed by the twinkling lights of the city below, clad in colors of midnight blue, is an experience to remember. 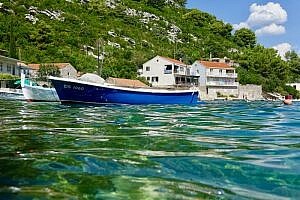 Croatian island life – the ocean, the people, their culture & livelihood in fishing and winegrowing captivated my heart. 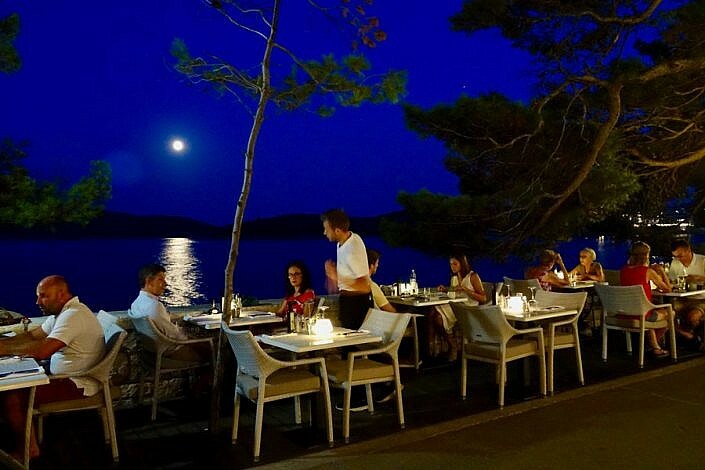 Mljet island, accessible by ferry from Dubrovnik, is a thin, but gorgeous strip of land, 32 km long and 3 km wide. East of Sobra ferry harbour, the island is rugged with a hilly ridge in the center, affording gorgeous ocean views in every direction and pristine beaches if you follow the windy roads down to the sea. Stone churches dot the wild-romantic countryside and traditional villages tell tales of olden times. Mljet National Park on the west side of the island is the oldest marine protected area in the Mediterranean. Accessed by windy roads through unspoilt Acadian forests, past quaint stone villages and finally by boat across a saltwater lake, the stunning Benedictine monastery with the Church of Saint Mary (built 1177) on a tiny island is alone worth the trip and just one of several attractions within the park! First settled by the Greeks, Korčula is the name of the major settlement and highlight of the island by the same name. 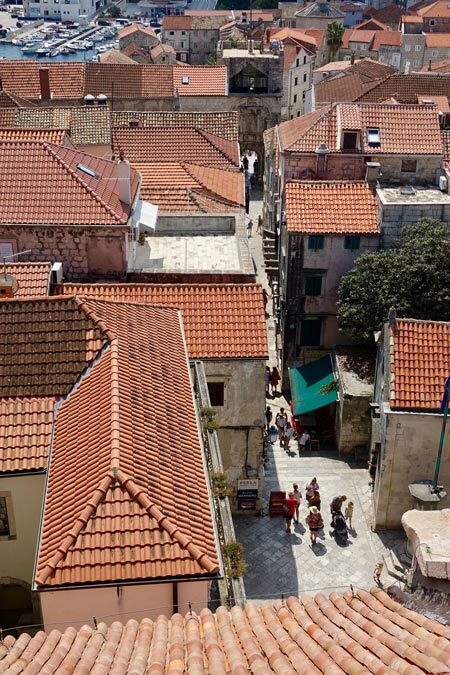 The medieval walled city, said to be the birthplace of Marco Polo, is laid-out along a fish-bone pattern: eastern laneways off the main street are curved to slow down easterly winds believed in olden times to bring the pest, whereas alleys to the west see through to the sea to allow for healthy winds. A romantic boutique shopper’s paradise, there is also much history to explore including the famous sword dances and, as everywhere, good swimming. Driving inland at Zadar, away from the coast and toward the Capital city, the scenery changes. 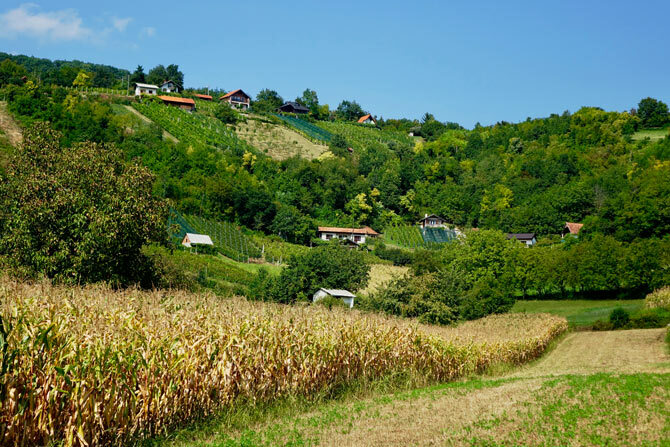 Passing small farm stands and continuously rolling agricultural land with cattle, grain and vegetable crops, I spent the last few days in and around Zagreb, a city feeling young and playful at heart despite its thousand year-old history and 18th-century Austro-Hungarian architecture. Throughout my travels, I experienced the Croatian people as friendly, helpful and accommodating; proud of their country, history and traditions; willing to help in any way possible. English and also German are widely spoken. Regional customs differ interestingly with changes in topography, economy, cuisine, folklore and dialect. Folk dances, music events, markets, crafts and traditional dress are living cultural heritage worth exploring in addition to architecturally stunning towns, museums, churches and cathedrals. Spending most of my time on the coast, fish was high on the menu, usually served with a spinach-like vegetable and a choice of potatoes, rice or pasta. 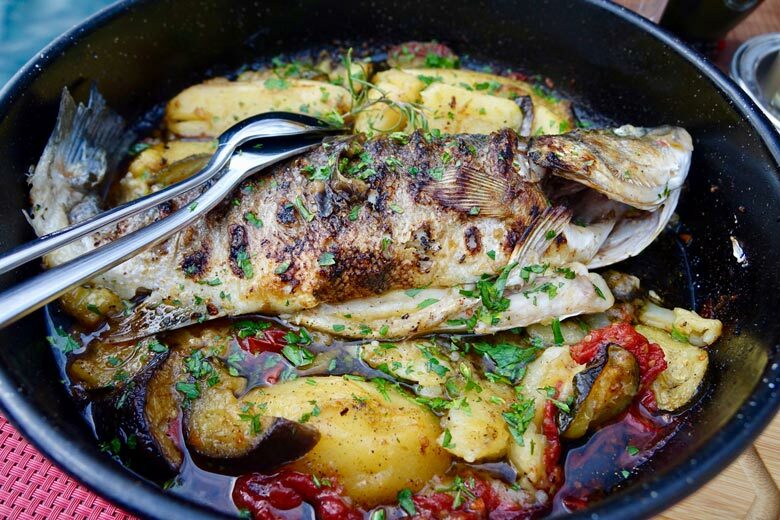 Outstanding was the traditional fish recipe prepared under a cast iron bell by fisherman Nick’s son on Mljet Island. Succulently stewed in its own juice with vegetables, herbs, potatoes & olive oil in a wood-fired clay oven, it was a memorable meal next to the ocean in the glow of the setting sun! Breakfast is usually a generous buffet in accommodations large and small with fruit, cheeses, eggs, bread, cereals, sweets & more in abundant variety. Roasted whole pig is featured throughout the country and beef and chicken are frequent menu items. As in so many hot weather countries, salads are smaller and not as diverse as in more temperate regions. 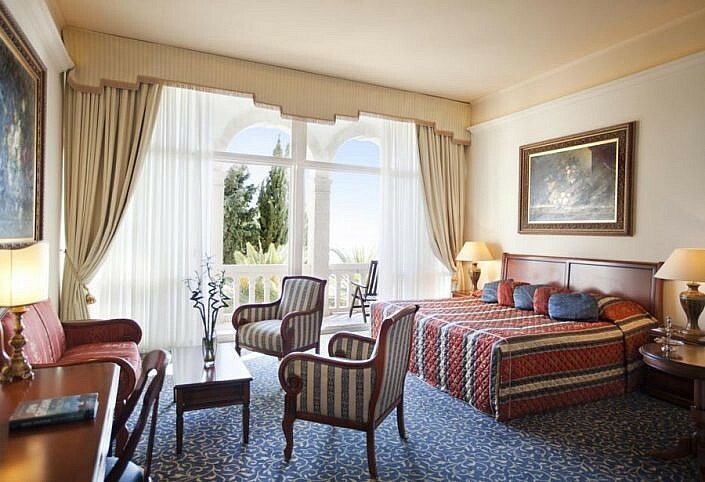 Staying from five a star hotel to Air B&Bs to country inns and dining in various restaurants, market stands and beach ‘pubs’, service was reliably from very good to outstanding. 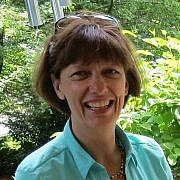 Attentive, accommodating, friendly and engaged, and always willing to go the extra mile with a smile. Meeting my hosts and eating out was a truly pleasant experience that made me feel a welcome guest. 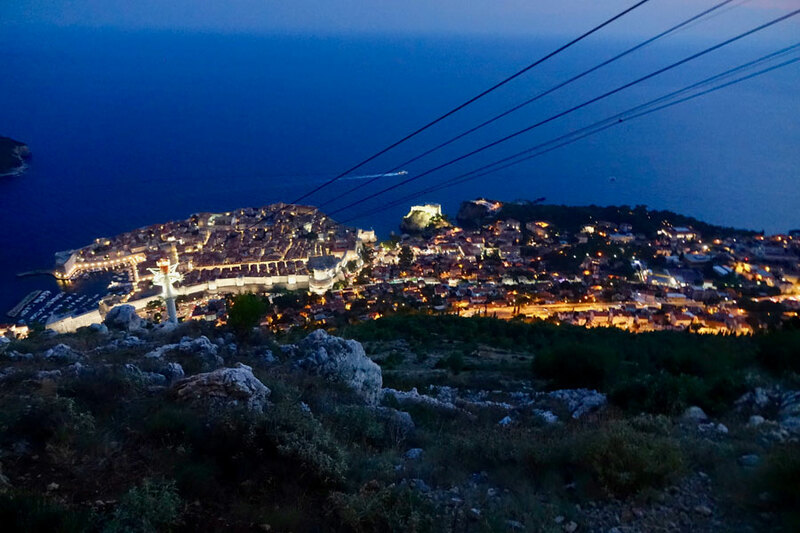 Most larger European destinations fly their country’s airline within two to three hours flight time into Dubrovnik. Croatia airline, which I took, also services most larger European cities. 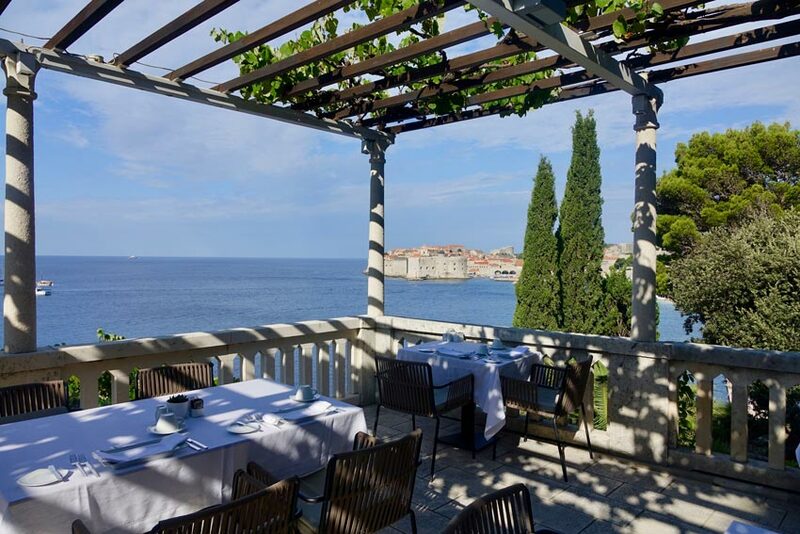 Renting a pre-arranged, automatic transmission car from a local rental agency at Dubrovnik airport proved inexpensive, straight forward and gave me reliable service. Roads and especially highways are well maintained and downright beautiful, as all of Croatia seems to be covered by endless forests. Driving is smooth. Parking in rural areas never an issue. Most towns and city centers are pedestrian-only with parking houses conveniently located at the periphery. Road signage is easy to understand. The best months to visit are May and June before the onset of major tourism, and again September and October, after which tourism goes dormant. Air and water temperature will still be pleasant. During July/August air temperature is in the 33-35 degrees Celsius range, but never humid. US Dollars, Euros and credit cards are widely accepted. You might find it advantageous to change at least some amount into the local Kuna. 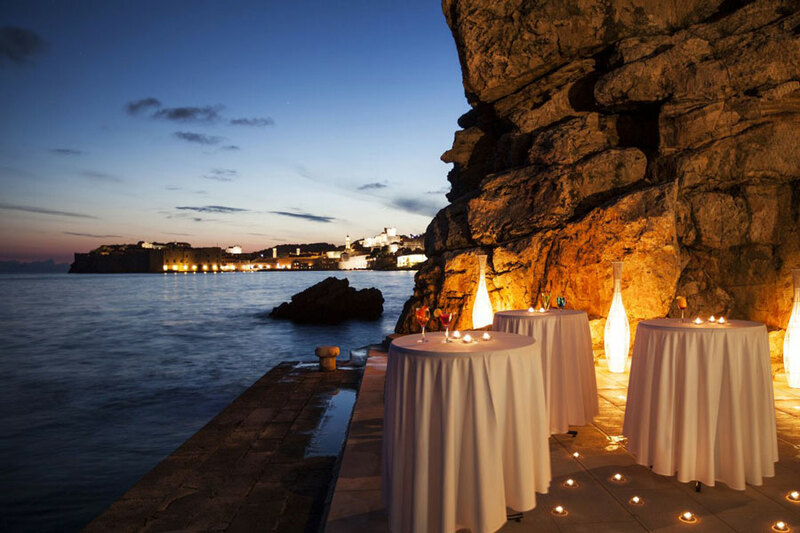 Croatia is an increasingly popular vacation destination with much to offer to the most discerning guest. Solo travel seems safe and independent travel is effortless if you’re of that mind. Many in-country tour operators offer all the sights, tours and schedules that can also be booked through overseas travel agencies. Whichever way is your preferred mode of travel, I sincerely wish that you will return as enriched and enchanted as I was! Croatia, ja ću se vratiti! Have you visited Croatia? Please share your favorite highlights and leave a comment below! It was a pleasure to meet you at our coffee on Tuesday and see you again Monday at the book club. I will also ask our website editor to include your website as a point of interest for our other members. 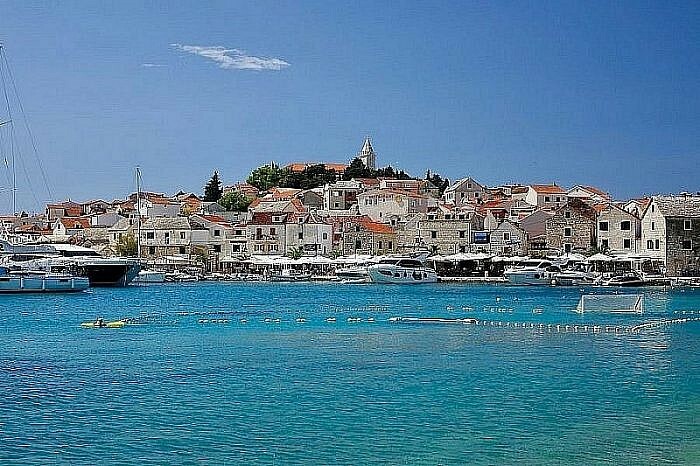 We are traveling to Croatia next June and I’ll forward your useful link to my family – thanks!